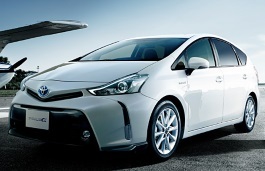 Correct Wheel Sizes, PCD, Offset, Rims and Tire specs for Toyota Prius a series. Hi,Ola,Can you explain your question? The <a href="https://comparebox.pk/cars/toyota/prius-alpha">Prius Alpha </a>is hybrid electric car closely related to the original Prius. It shares all the modes and technology with the Prius 2010. It has a push start button, backup camera, hill start assist, led lights, pre-collision system, dynamic radar cruise control and parking assistance controls. It is also equipped with Toyotas new multimedia and new sunroof.